On business culinary that developing increasingly, those businesses owner trying to compete for each other to get customer’s hearts. The hype of the development of culinary makes the businessman makes a plan from A to Z, in addition, to avoid business bankrupt. However, chances of the new business culinary now present like culinary in Japan, Korea, and Chinese. The truth that cannot deny is the new generation has been entered by foreign culture and make lifestyles and culinary tastes different. 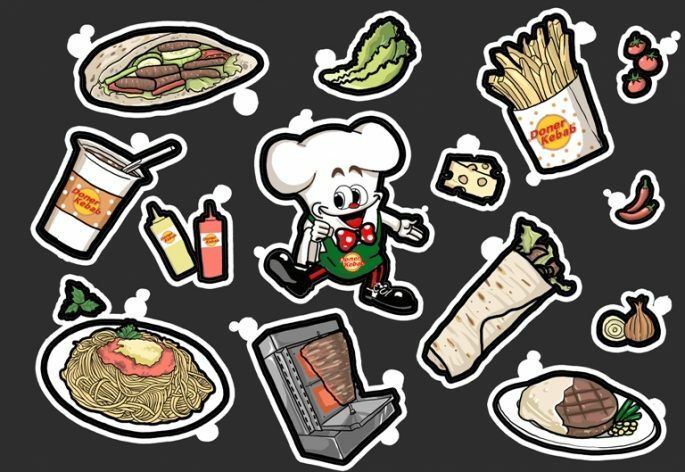 Therefore, a lot of culinary businessmen that have a business with foreign food like Japan, Korea, Chinese, et cetera keep looking and progressing innovation with their food, services, and room decoration so it can make the customer happy and loved to stay at the restaurant. A restaurant must fulfill what customer is expecting not only affordable prices, a taste, service, and decorations now becoming the important measure in customer’s eyes so a lot of people is interesting to visit your restaurant. Talking about decoration this time interior design restaurant is an important factor for lifting up the atmosphere, taste, and coziness. A few of restaurants have chosen a mural for becoming their interior of the restaurant so the atmosphere becoming more comfy, unique, and attractive within a certain culture. 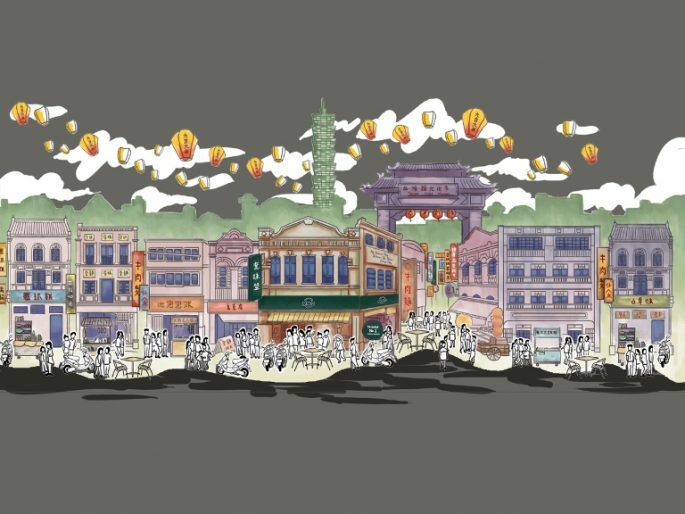 Here a few mural illustrations with concept characteristics restaurant like other countries such as Japan, Korea, Chinese, to Sunda. Indonesia people always have a curious feeling to try something new like Japan foods. Let’s say the lover of Japanese food is increasing time by time such as takoyaki, sushi, and sashimi those foods it not rare to hear or to know either it is becoming someone’s favorite food. Within increasingly food lover of Japanese foods, it is made a Japan restaurant that totally related with Japanese food and Japan ornaments. Hashi is a Japan restaurant that located at Summarecon Mall Serpong. Hashi providing a place with up to date interior by choosing mural with the concept of cherry blossom country. Two objects that really related with Japan atmosphere like cherry blossom tree and Fuji mount are chosen for background in the mural. 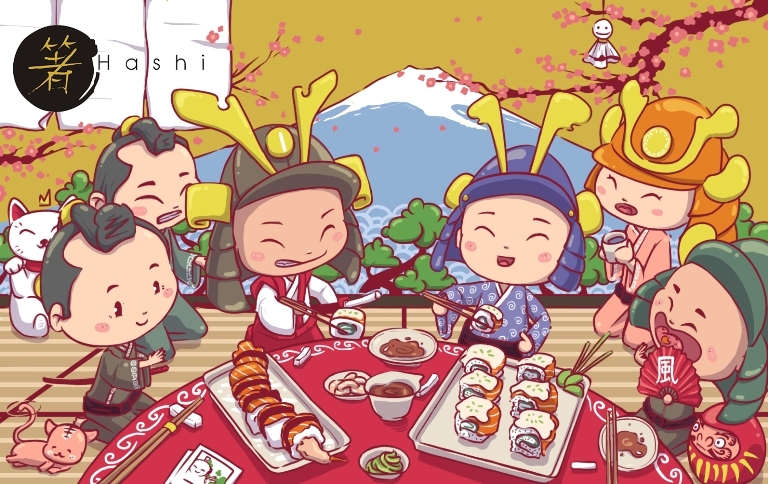 Within a happiness illustration, it is showing a few of characters dressed like Japanese people eating together in the open room with a cheerful expression. Do not forget the Japanese food menu that showing in this illustration like sushi and sashimi. Still talking about Japan Restaurant this time a restaurant called Kokeshi Teppanyaki that located in South Jakarta. What is teppanyaki? Teppanyaki is a Japanese food that using an iron flat grill. Derived from two words “Teppan” it means flat iron and “Yaki” it means grill. The food that used to grill for teppanyaki is very various like meat, vegetables, and seafood. Usually, the enjoyment added when we got to see the chef in action while cooking teppanyaki. However, the spreads teppanyaki restaurants in Indonesia the business owner trying to makes theirs more different and more attractive. 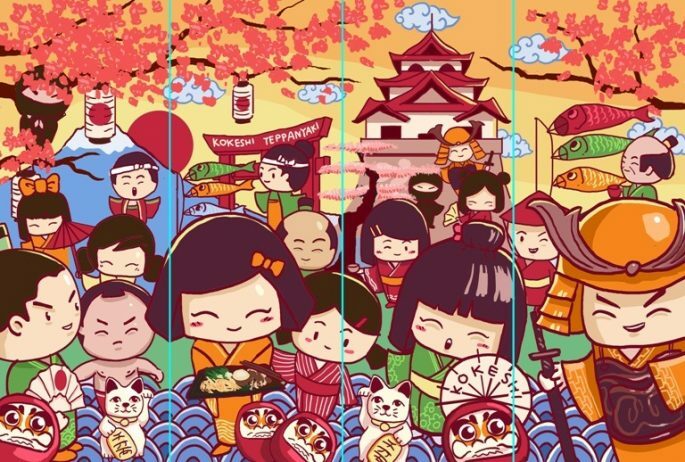 Choosing with illustration as wall painting with the related concept from Japan; Cherry blossom and Fuji mountain are the main characteristics for its mural background. Besides that, the adorable characters that dress up as ninja along Japan soldier look in this illustration. In this picture also the restaurant name of the restaurant “Kokeshi Teppanyaki” that showing in the board and Japan woman character showing teppanyaki food. The restaurant or Kokeshi Teppanyaki illustration is really unique and attractive with expressions of the characters that really happy is expecting to makes the atmosphere more fun and cozy. Did you know? 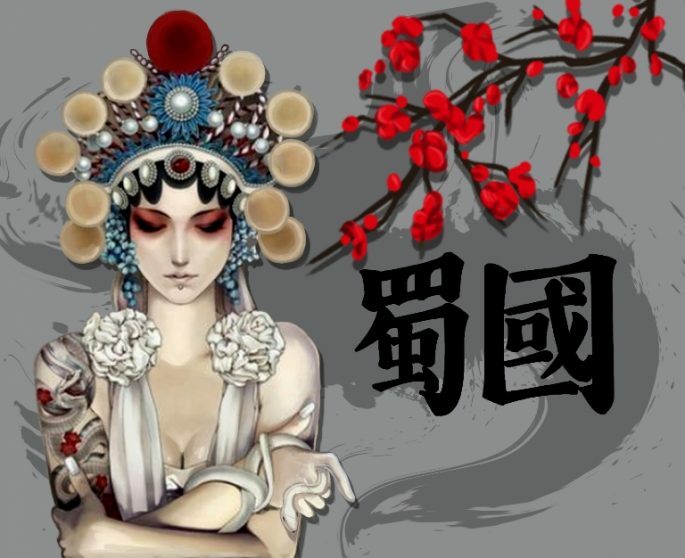 Chinese have been living in Indonesia less than from the fifth century either the variety of ethnic in Indonesia not only the indigenous itself, Indonesia have a lot of ethnic that lived in it even among of us all. Other nations like China or Chinese have an important role while it is the color from the life of Indonesia society. This thing became acculturation culture and affecting in culinary thing. Chinese food that really familiar called with capcay, kwetiau, and bakpao instead became the favorite food of Indonesia society. Actually this culinary of acculturation between Indonesia spices with China food itself. Santung restaurant is one China restaurant that providing various menus. Shantung restaurant itself already got a special place in customer’s hearts. Because this restaurant been serving Chinese food for so long until now, the restaurant still serves the food with the same taste as much as the beginning of the restaurant when it is established for the first time. Nonetheless, in addition to the customer bored causing of design interior that really old-fashioned like the old times. The owner of the restaurant renews the display of the restaurant representing the present time. The chosen method from Shantung by changing the tables and chairs set and the most interesting thing is adding painting wall as known as a mural. Finally, the concept is following with cute characters that dressed up like Chinese with China ornament like red lampion. 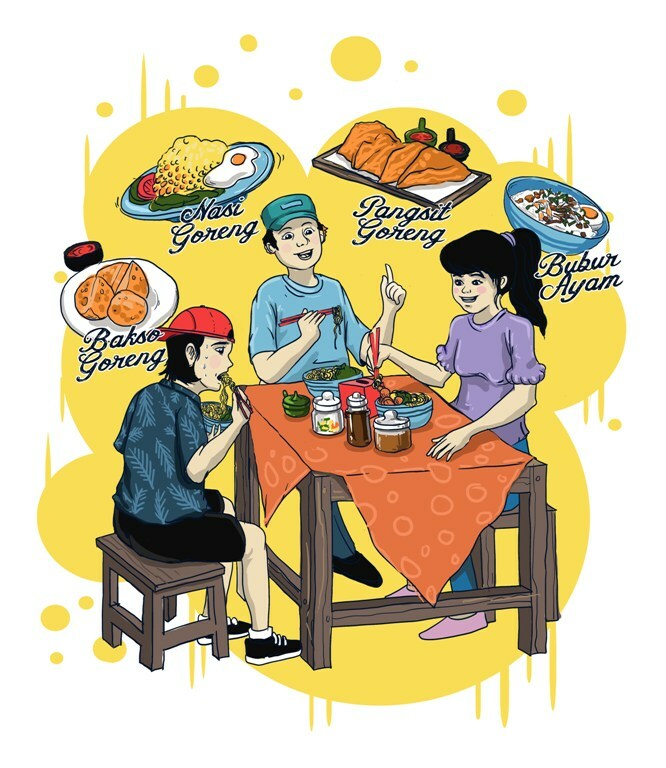 This is mural illustration describing how the feeling of eating in togetherness that they are sharing within cheerful and happy expressions of each character they give. Within more globalization of Korean music and Korean drama in Indonesia, like it or not the culture of Korean have been entering Indonesia including the food itself. However, the similar taste of Korean people like spicy, sour, and salty are the factors easiest acceptable for the Korean food in Indonesia. Now while the restaurant more spreading like everywhere it is a business chance in the culinary field of Korean food that guarantee enough for business. The reason is a lot of people that already ate Korean food as their favorite menus like Ramyeon, tekoppoki, bibimba, and others. A Korean restaurant such SamWon located in Cirebon it is giving something different with Korean restaurant in general as if the different place of Samwon it is by the walls decorates itself. Where the walls in the restaurant decorated by a mural that concept by Koran feels. Painting walls illustrated a girl and a boy dressed like Korean people. For give a related touch of Korea atmosphere it is adding with few houses or buildings of Koreans. 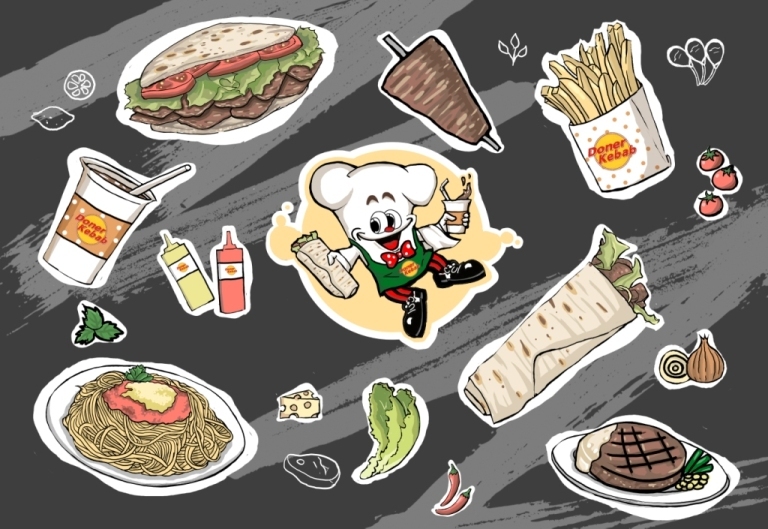 This illustration is expecting for able to lifting the atmosphere and causing the customer feels the sensation while eating like it is feels eating in Korea. At Samwon restaurant there are two painted walls. This painting contains two walls and as before we have discussed, the Samwon restaurant makes the interior design become fun and attractive. 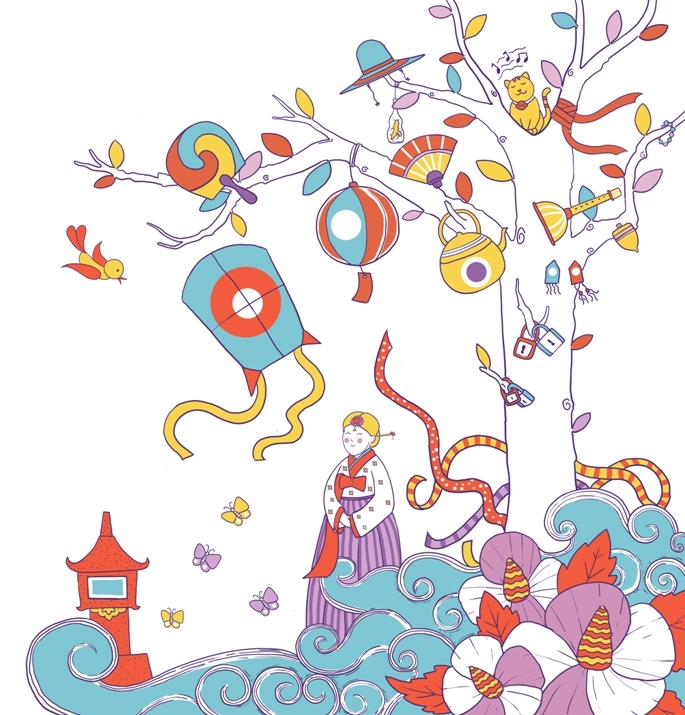 With this restaurant illustration showing a woman complete with her Korean outfit standing below a tree with ornaments such as kite, lamp, fan, and others. Flower ornaments it is shown too with combining waves as decorative that describe proper wind, flying butterflies to beautify the magnificent sky. It is shown a building over a long distance because the shape looks small, besides that the selection color either reflecting a crowd and cheerful impression. Different from the previous topic about a restaurant, this time a mall called Bay Walk Mall Pluit is one of the Malls that gives a unique place and different from other shopping centers in general. With lifestyles changing the function of the mall as the shopping place is changed. The truth is the mall becoming the destination place for hangout with friends, best friend, family, and the beloved ones. So there is nothing wrong if mall not only serving the world of fashion either it is including the world of culinary and entertainment. For give coziness and satisfied for visitors the mall trying to make and designing the mall to be pretty and beautiful as possible. For adding the unique and attractiveness, the mall did some wall decoration with applying some murals. Mural illustration selection feels like the market with various traditional food, with some China lampions to make something unique that showing an impression of crow on the location. Those mural illustrations with the culinary concept can inspire you if you want to decorate room interior with a mural. In every the making of a mural, there must be a concept that needed. Because a concept could be an important step for creating a beautiful and meaningful mural. Every mural is expecting to able to earn an attractive creation and able to give positives impression for everyone who sees it. A mural was designed to fulfill what a client needs and wishes for their mural. 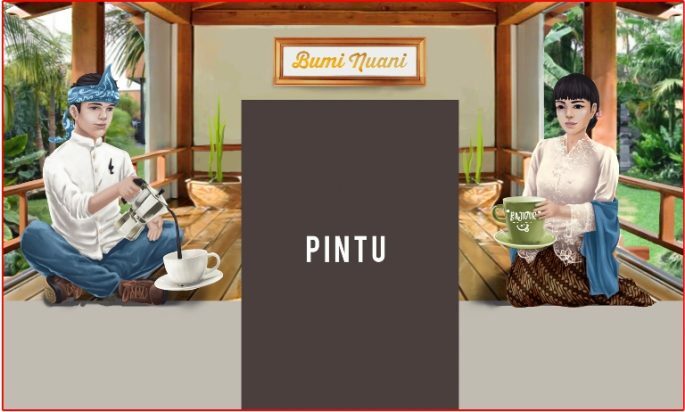 This time Bumi Nuani intrust IMURAL team to makes the Sundanese illustration to show its coziness side. The mural illustration that is a woman dressing in a peach dress and a man dressing white top and hat of Sundanese. Both look so enjoying a drink. In the mural, it shows an atmosphere around the place that go-green and leafy. 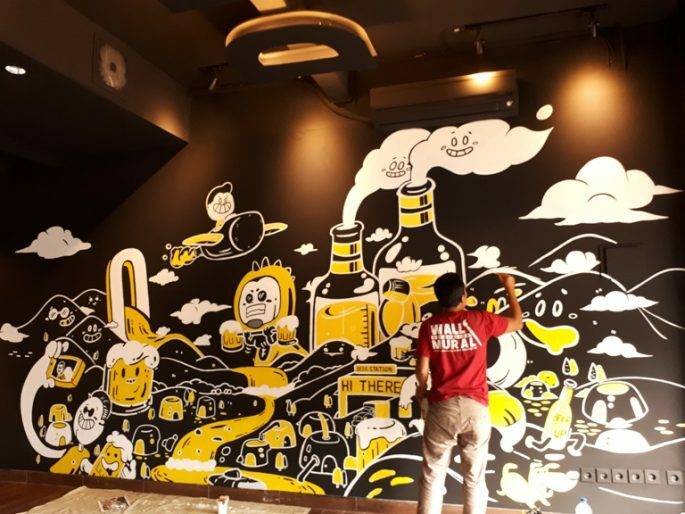 By the atmosphere around the restaurant that looks original and soothing, the mural concept it is really suitable for wherever it is because West Java it is popular with a beautiful and soothing atmosphere. A restaurant competing themselves to makes the restaurant different with any restaurant out there, starting from a type of restaurant to design interior concept. Now its many various restaurants that decorating the interior to captivate visitor attention because the comfy interior can make customer loves to be in the restaurant. As well as Restaurant Sunda Bumi Nuani that decorating the interior with a mural Sundanese illustration. Like mural illustration first option that put forward beautiful, soothing, and coziness impression but it is still a bit different. 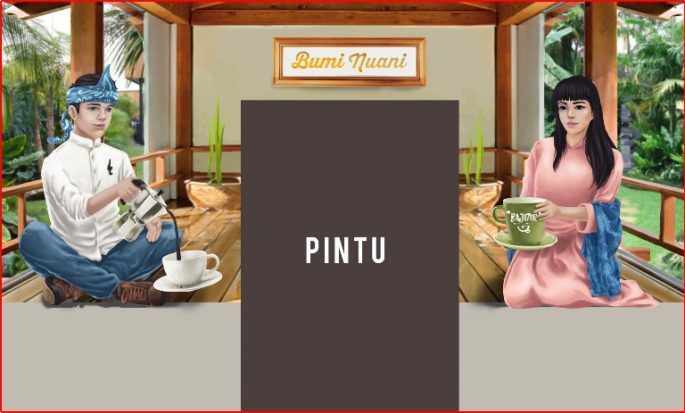 The differences are on the woman by the beginning in illustration option 1 she was wearing a peach dress and now it is the revision with white kebaya of Sundanese with a little touch of hair-do like Sundanese. This mural is expected able to become the attractive thing of the visitor along to makes the atmosphere comfier and relax. From the various culinary business that exists, a fried duck restaurant become the big part of favorite food in Jakarta. Mostly, duck restaurant makes the menu become various. However, there is a difference with this duck restaurant. The duck restaurant Kapahiang Babase or Duck BKB provides fried duck menus as the display with black and soft texture. The soft texture and juicy is made by the making process that takes time almost 24 hours and using a lot of spices and ingredients. This Bengkulu Fried duck becoming people favorite from any ages. 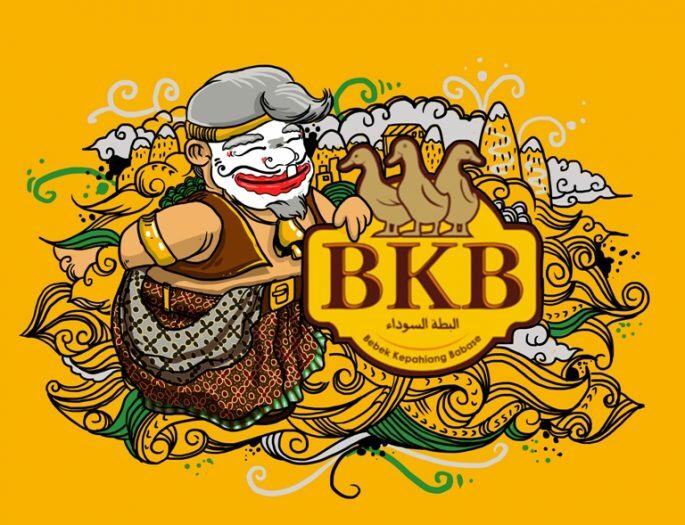 But to attract people attention then it is made a mural illustration that unique, attractive, with yellow color as dominant color yet it is the characteristic of BKB Duck plus the character similar with wayang semar. Does this illustration makes the place more fun and attractive? It is! Almost the same with the option 1 the yellow color still the dominant color to decorate this mural illustration. The differences are on the face of illustration character that does not use a mask just like Semar. 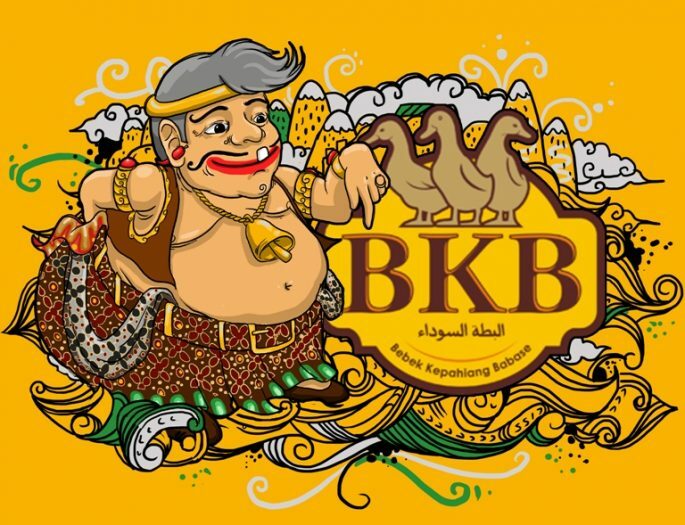 Like a father that wearing a traditional outfit and showing the finger directly to the logo of BKB Duck. The name of Bebek Kepahiang Babase itself has the meaning itself. Duck it means the main menu of the restaurant while Kepahiang is the name of a village in Bengkulu, later Babase in Bengkulu language means to invite. So, BKB restaurant BKB has a meaning to invite people for enjoying fried duck that cooking by special methods with the recipe by Kepahiang Village in Bengkulu. This duck restaurant remains crowd by visitors. That way to make customers comfy while its crowds. The restaurant applies the wall décor to beautify the room and makes the atmosphere comfortable. We can see the characteristic of a restaurant by a wall painting or mural that illustrate culture from the restaurant itself. In the field of culinary business, it is totally amazing to do, it is because everyone needs to eat. Either the society is getting more consumptive and makes the businessman really wanted to open the business in the culinary field. Meatball business, for example, it has been the best choices for the businessman. A business can say easy-peasy yet sometimes people find it difficult. Like the meatball business that success till have a lot of branches but plenty of stacks that couldn’t stand in some period of time. Meatball business used to be known as the ordinary stall. Now changes become a restaurant with a huge room. It is because of a lot of customers that comes and captivates with the good taste of the meatballs. As well as Bakso Lapangan Tembak Restaurant which so popular with their great taste of meatball that success for captivating people hearts. For adding cheerful situation, Bakso Lapangan Tembak choosing a restaurant illustration with a fun concept. On the mural is illustrates customers eating meatballs, not only just that unique there are various styles and clothes type they are wearing while sitting at the same table. Besides that, the supports ornament like soy sauce, ketchup, and sauce its show. Even it just a black and white illustration yet this illustration still attractive. Plus with the existing ornament on the yellow background in the illustration, it gives a symbol of happiness that created when eating in this restaurant. So the illustration describing that everyone with variant social status could still enjoy Bakso Lapangan Tembak. Illustrates that Bakso Lapangan Tembak has a large market segment. At the moment culinary business especially meatball indeed much selected, the taste that really familiar with the tongue of society makes market segment is getting huge. By the expanding market segment, of course, the meatball businessman competing for their meatball as the difference or the unique one than any meatballs in general, good in terms of special recipe, even the place that provided. Now meatballs becoming favorite food for everyone. Even though there is a thing that makes consideration customer which is the place itself. The comfy place must have in addition to the customer to love being at the restaurant and do not makes the customer runaway because there is a deficiency of its place. Bakso Lapangan Tembak makes a comfortable place for the customers. 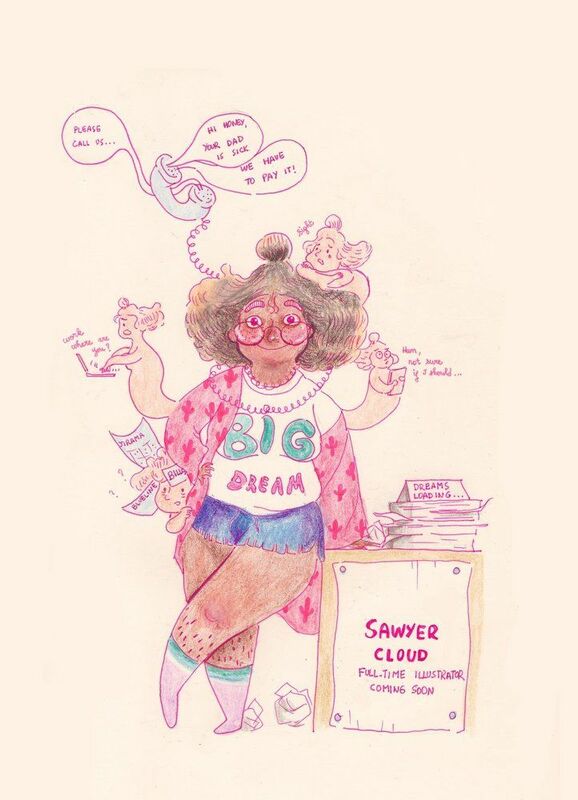 Plus there is an illustration that makes the situation more fun. With the same concept as before, various ages from kid to adult can eat Bakso Lapangan Tembak and all looks enjoying the meatballs, makes the room comfier. Culinary that expanding, makes menus from other country or outside of the country is show up and of them is steak. Now steak has become people favorite’s food an there are kinds of steak that loved by the food lover. Been a lot of restaurants that serve steak menu as the main course. So you don’t need to worry about looking this kind of food. Even loved by many people, the truth is there are many consumers that confusing when they are going to order steak because there are many variants of steaks. 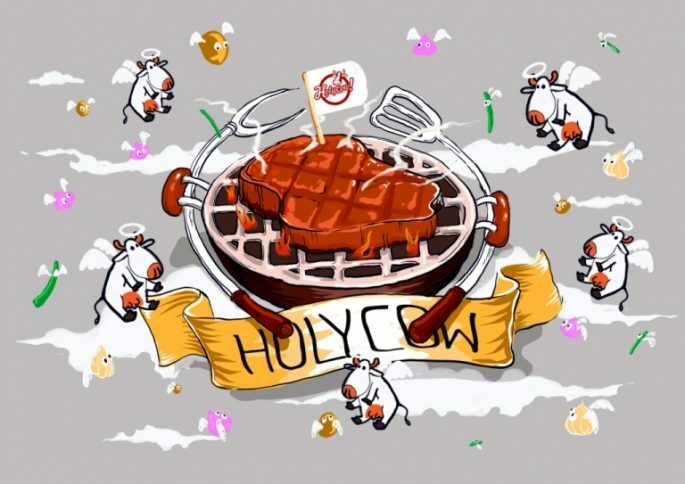 Now steak restaurant like Holycow has been known by many people by the steak lover, creating a comfy interior and adding illustration on the walls of the room. In this illustration, the steak is grilling and looks very delicious. Marked with ornaments of cow and others that focus with the steak. The illustration describing a delicious steak and attract the taste of the customer to eat the delicious steak. Various type of foods that comes from outside country to Indonesia is easy to accept by the society. Start with heavy meals to snacks. Even not many people favorite the foods. Example types of food like kebab that comes from the east country which is Turkey and this is so familiar for the society nowadays. Did you know Turkey and Indonesia kebab is enough different? Equally based on a meat, but the serving is different. Turkey kebab is serving in Indonesia usually in form of cow meat that grilled combined with various vegetables then wrapped with bread that called tortilla. But where the food came from, actually kebab referring to meat that grilled before ends up serving in various ways. One of serving is wrapping the meat with bread and gives variant vegetables and sauces. This time a kebab restaurant Doner Kebab which is various kind of menus but with the kebab as the main menu it makes the atmosphere of the restaurant different. With an illustration of menus in Doner Kebab, makes a happy impression for the room itself. Still, about restaurant illustration for Doner Kebab, this illustration is the second option at a time this illustration is chosen for mural decoration. The differences illustration is from the background with grey scratches. 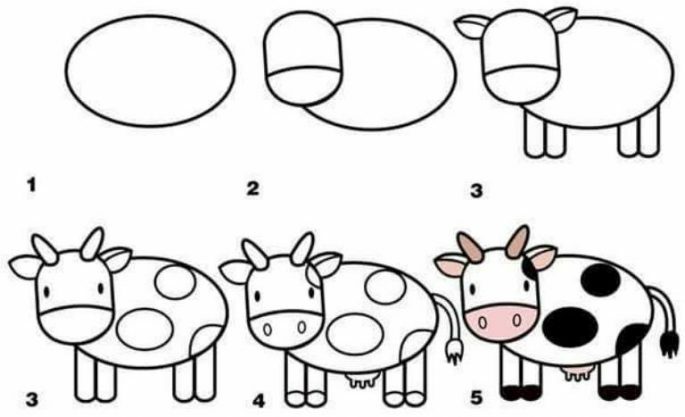 If you see carefully, the black line or line art in the first illustration was erased in this second illustration and replace with white color so the object not too assertive and harsh. Not only that, we can see the differences can be seen from the picture of the chef that as the beginning not holding up the menu in Doner Kebab but for the second option the chef took the menu. Much various seafood restaurants have already established in Indonesia. Indonesia with a nickname as the maritime country, produced processed seafood abundant. For that many culinary that serving seafood like Ikan Bakar Poco-Poco Q Big Restaurant. With supporting atmosphere of the restaurant or comfortable place it makes the customer loves to be there which the room decorating by an illustration of Ikan Bakar Poco-Poco Q Big Restaurant. The illustration concept that uses in this illustration that a place to eat seafood, where there is a chef that burning a variety of fishes and lobsters. Plus a portrait of a few visitors that sitting and enjoying the food. This illustration adjusted by the atmosphere related with Ikan Bakar Poco-Poco Q Big Restaurant. 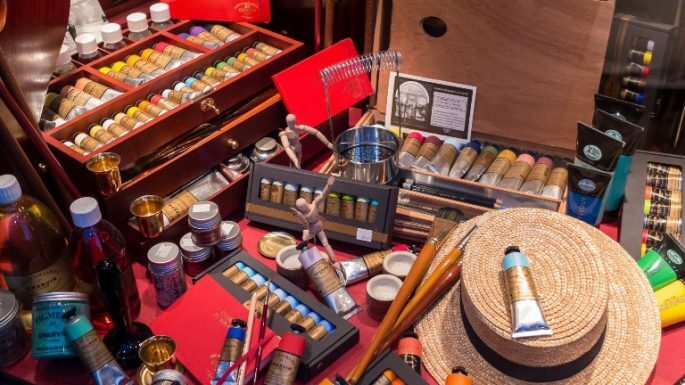 the color selection that used in here is monochrome within few objects that use bright colors like red and yellow for make the mural more alive. Now plenty of places offering grilled fish that yummy! The soft fish meat that spiced and served with the grilled way it makes the fish more delicious to eat with sauces as the additional for the fish. A restaurant illustration is processing the fish to grilled delicious fish is showing in the illustration. With a few of fishes that grilled above live coals. Not forgetting there is a smoke that becomes a source of a smell from a food that makes the visitors teased. This illustration trying to show a process to cook a fish which ending up become delicious food and ready to eat! In Indonesia has spreading foreign restaurant such as Chinese food restaurant in the variety of places. This time Chinese food name Grandma’s Suki has been one of the restaurants that pretty popular with various food that offering variants sukis also other Chinese foods. 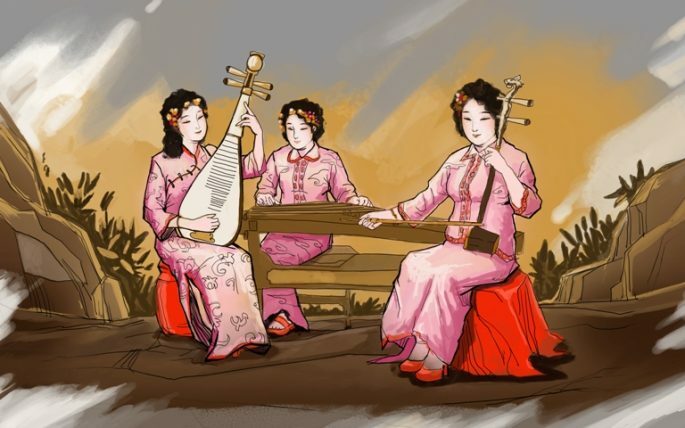 For beautifying the room, chosen illustration of girls that playing traditional music instrument of Chinese which Gunzheng, Pipa, and Erhu. By wearing China traditional outfit, the three the music player looks happy. They are playing music outside the room while showing beautiful and pretty scenery. With so many Chinese food restaurant, a Grandma’s Suki restaurant is one of the restaurants that have a lot of fans. Indeed, this restaurant is really suitable for a family gathering place. Besides that, the huge portion from Grandma’s Suki menu is the possibility to share with your beloved ones. Therefore the comfy place will be the main factor in visiting a restaurant. So, Grandma’s Suki restaurant choosing about happiness. 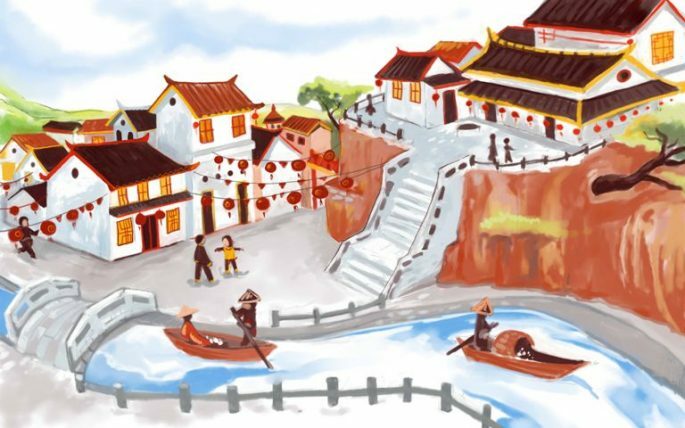 In this illustration that related to the harmony between society and really familiar with a village in Tiongkok. By lamps ornament that hanging to decorating the street and village. This illustration is expecting anyone that visit Grandma’s Suki will be a feeling of happiness emotion and harmony that related to Chinese. Actually not only Chinese restaurant and Japan that have their lover by Indonesia society. A lot of Indonesia society that loved Taiwan food. So from that My Warm Day restaurant that really popular in Taiwan now it is open in Indonesia. In this restaurant was chosen room decoration which mural illustration of how the atmosphere a city within the city activities. With concept sky color that dim reflecting that people still doing activities and not lowing their spirits. It means that My Warm Day restaurant present from many activities way of resting is by eating in this restaurant. Makes your day more comfy and cheerful. Taiwan food is much people love it already. So My Warm Day is the exact choice for you to taste Taiwan food. One of the best restaurants not only offers tastes but also creates coziness. Like a cheerful illustration which illustration crowd in a big city that how busy they are, they definitely have a spare time to gathering with their inner circle plus, My Warm Day is really supported to resting their day after going through many activities. Not a must foreign food, traditional food still has many lovers even few people much choosing Indonesia food because doubting for taste other country foods. 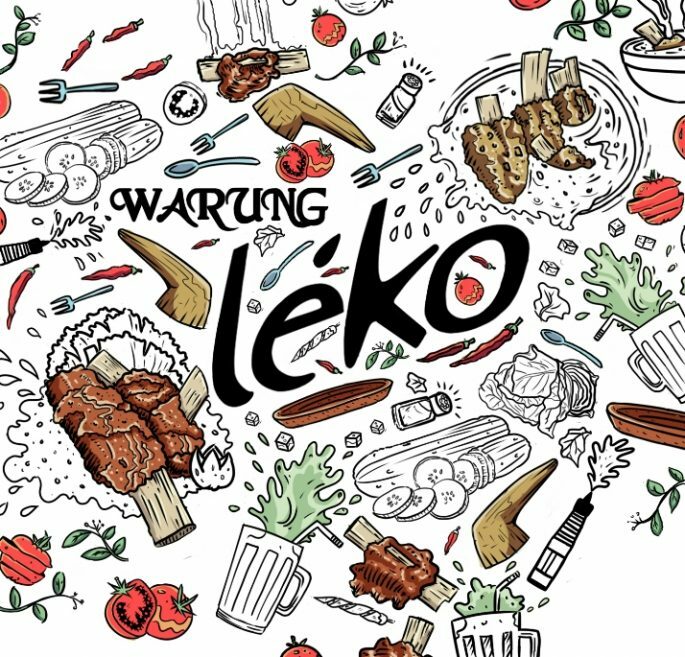 Warung Leko is one of restaurant that offering variant traditional food menus. The delicious menu but the price so affordable which makes this traditional restaurant really interesting to try or visit again and again. 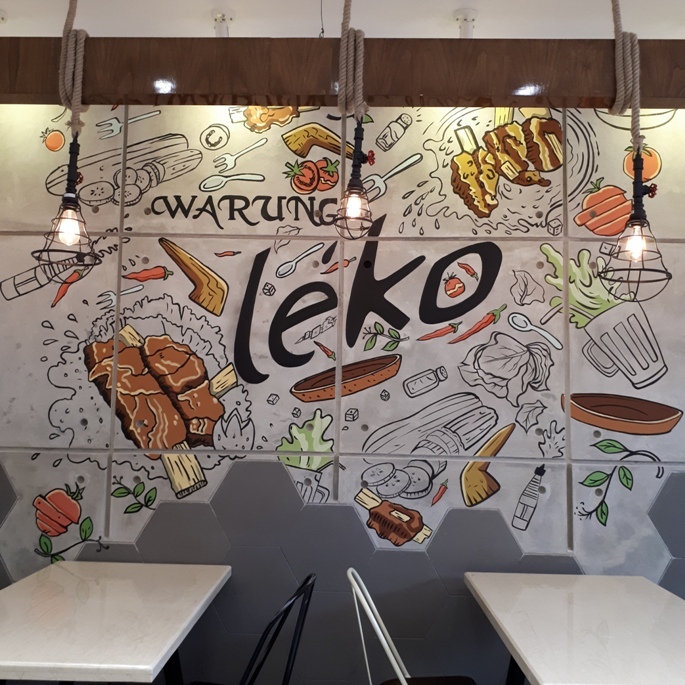 With so many visitors, the restaurant adding illustration with the crowded concept to reflects the situation of Warung Leko. With black-white sketch and yellow color that playing able to increase appetite. Usually, food places are often found in Mall or certain places. This time a restaurant in the hotel called Maxley giving restaurant facilities that not only for Hotel visitors but for everyone. With a comfy interior of a restaurant, of course, it can be favorites for everyone plus with affordable prices. In decorating a room’s Maxley restaurant chosen an illustration that describing a cheerful restaurant, directly with the color selection that fun which red and yellow. The using color for the background with light brown makes few people that illustrated in the illustration looks more visible and created proportion harmony color.